Fixed problem when clicking on Pending... text when expanding tree in checkout wizard. Exception during checkout of project set could hang Eclipse. WC to WC copy was not copying local contents. Performance improvement in Synch view when resources have been locally deleted. Remove forced refresh after Switch/Merge. JavaSVN includes fix that makes this no longer neccessary. Refresh the Synchronize view automatically after performing a commit from the view when the Show Out of Date folders option is on. If resource is managed but also in global ignore list, we should not ignore it. Fixed potential NPE in refreshing SyncInfo. 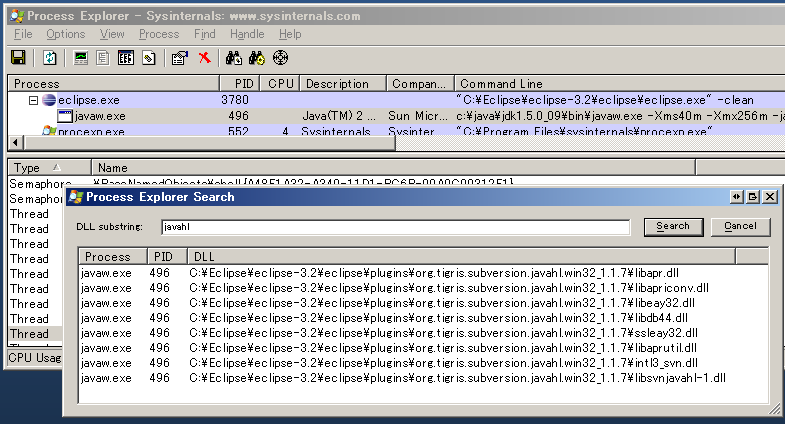 JavaHL 1.4.0 binaries for Windows. Change order of tabs in decorator preferences to match CVS plug-in. Added a preview pane to the decorator preferences to match CVS plug-in. Improved retrieval of log messages in Incoming Changeset mode. Additional improvements to handling of .svn folders. Removed the Show Pending Operations view. This will result in an error reloading any Perspectives that had the view open. All functionality of this view has been improved upon by the Synchronize view. Removed the Add Keywords dialog. The properties management features provides everything that is need to manage the svn:keywords property. Restructuring of menu items to match the CVS layout more. Add support for commit templates, similar to those provided by CVS plug-in. Add support for spell checking in commit messages. Fixed potential NPE in Update from Synch view. Fixed NPE when sharing project that has .svn metadata folders. Fixed decorator refresh when deleting a property. Export from Working Copy was not exporting the contents of the working copy. Fixed NPE in Checkout wizard when a revision is not specified.